The paintings are often of no specific place, but rather are synthesized from many experiences and memories. I travel a fair amount, often internationally, accumulating these ideas before painting them in my studio on Gabriola Island, B.C. Canada or in Lima, Peru. I do not foresee any sudden thematic changes in my work, but rather a continuation of the artistic progression I've been making for more than thirty years. John Ogilvy was born December 11, 1961 in Vancouver, British Columbia, Canada. 2014 - 2016: Bezanson Art Consulting, Vancouver, B.C. 2014 - 2016: Artworks Gallery, Gabriola, B.C. 2009 - 2014: Ian Tan Gallery, Vancouver, B.C. 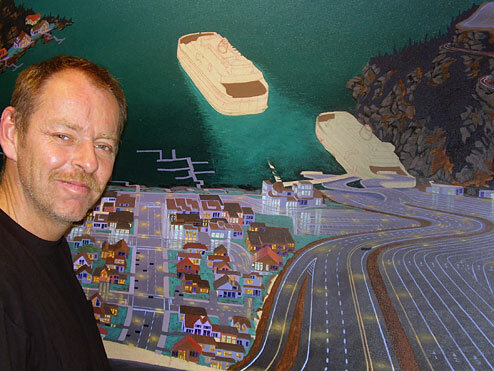 2001 - 2008: Artworks Gallery, Gabriola Island, B.C. 1998 - 2008: Bezanson Art Consulting, Vancouver, B.C. 2014: Solo Exhibition at Artworks Gallery, Gabriola Island, B.C. 2012: Solo Exhibition at Ian Tan Gallery, Vancouver, B.C. 2010: Solo Exhibition at Ian Tan Gallery, Vancouver, B.C. 2005: Solo Exhibition at Art Works Gallery, Gabriola Island, B.C. 2002: Solo Exhibition at Art Works Gallery, Gabriola Island, B.C. 2000: Solo Exhibition at Malaspina College Public Gallery, Nanaimo, B.C. 1998: Solo Exhibition at Acme Fine Art, San Francisco, California, U.S.A.
1989: Solo Exhibition at Woltjen / Udell Gallery, Vancouver, B.C. 1988: Group Show at Woltjen / Udell Gallery, Vancouver, B.C. 1988: "Images and Objects" Group Juried Exhibition, Vancouver and Kimberly, B.C. 1988: Emily Carr College Graduation Student Art Show, Vancouver, B.C. 1987 - 1988: "Artists in the Square" Group Juried Exhibition, Vancouver, B.C. John now also has a studio in Lima, Peru since December 2008.